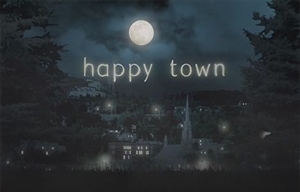 Happy Town is an American television drama series created by Josh Appelbaum, Andre Nemec and Scott Rosenberg and produced by ABC Studios about a small town called Haplin that is haunted by a number of unsolved kidnappings, which faces a dark new crime that brings all its unresolved fears to the surface. The show premiered in the USA on ABC on 28 April, 2010. There are eight hour-long episodes in the series. Happy Town premiered in South Africa on DStv's M-Net Series channel on Monday 24 May 2010, at 19h30. New episodes air weekly. Haplin, Minnesota, "Happy Town," has enjoyed an uneasy peace for five years, but all that is about to change. Still haunted by a number of unsolved kidnappings, the small town now faces a dark new crime that brings all its unresolved fears to the surface. Has the elusive "Magic Man" - who many believe is responsible for the bizarre abductions - returned to claim another victim? As Haplin's mysteries are revealed, many of its prominent citizens' motives come under scrutiny as their own secrets and personalities are peeled back one layer at a time. Dragged away from his idyllic family life to investigate the new spate of crimes, Tommy Conroy (Geoff Stults), a small town deputy under the wing of his dad, long-time popular Sheriff Griffin Conroy (M.C. Gainey), has never had to take charge of Haplin's law enforcement. His comfortable lifestyle is suddenly turned upside down by a bizarre set of circumstances and he must learn to pool his smarts - without the necessary training and tools - to rally the residents, as well as to keep his wife, Rachel (Amy Acker), daughter Emma (Sophia Ewaniuk) and the rest of Haplin safe. On the other side of town, the long shadow of the Haplin founding family, represented by mysterious matriarch Peggy Haplin (Frances Conroy) and her son, John (Steven Weber), who runs the local bread factory, "Our Daily" Bakery and Confectionery, try to maintain control. John's daughter was one of the Magic Man's victims, and he has not given up hope of finding her and seeing justice done. Little does he know that his son, Andrew (Ben Schnetzer), has been carrying on a hot, secret romance with the Conroys' babysitter, Georgia Bravin (Sarah Gadon), who is definitely from the other side of the tracks. When Henley Boone (Lauren German) drops in on Haplin, she is struck by the purple mountain majesty of this sun-splashed town, tempered by a recurring bit of curious graffiti - a halo with a question mark under it. Henley's mother used to spend time vacationing here, and while looking to uncover information about her family's past, Henley finds herself drawn into a web of romance and intrigue she never could have foreseen. What's she really here for, and can she be trusted? But Henley isn't the only outsider to make a home in Haplin. From his charming but irrelevant film memorabilia shop, The House of Ushers, to his way with the lively widows residing at the Meadows Boarding House with him, the ever-dapper Merritt Grieves (Sam Neill) seems strangely sinister... or is he? What does he have to hide? Haplin is full of colourful characters, including Big Dave Duncan (Abraham Benrubi) and the nefarious Stiviletto brothers, but many in this small town in middle America have skeletons in their closets. Who will step up and help unearth the secrets that have festered under Haplin's cheery exterior? How will its citizens deal with the revelations? And who is the "Magic Man"? Does he really exist, and can he be stopped? Happy Town stars Geoff Stults as Tommy Conroy, Sam Neill as Merritt Grieves, Lauren German as Henley Boone, Steven Weber as John Haplin, Amy Acker as Rachel Conroy, Sarah Gadon as Georgia Bravin, Robert Wisdom as Roger Hobbs, Jay Paulson as Eli "Root Beer" Rogers and Ben Schnetzer as Andrew Haplin. Josh Appelbaum, André Nemec and Scott Rosenberg are executive producers.